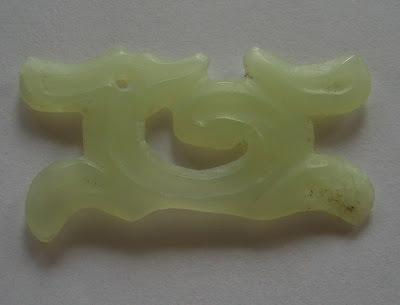 Here is another Hongshan style pendant which was purchased together with the one in previous post. I am not normally a collector of replicas, but this one is such an amusing, inventive adaptation of the Hongshan classic Cloud pendant, that I couldnt resist. The original Hongshan cloud pendant is normally represented by an abstract pattern. The forger/reproducer of my piece has copied the original design and added a hole in the upper left and hey presto it is a sweet little deer! This cloud pendant turned deer measures 3.6x1.9cm.